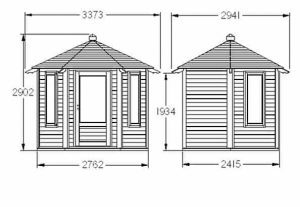 The Hartwood 11′ x 10′ FSC Newbold Summerhouse is a wonderful summerhouse that has a very classy design and is also offering you a very generous amount of floor space to make use of. The size of this means that you really can lay this out just the way you would like and not have to make any sacrifices like you would a smaller summerhouse. It has a fantastic hexagonal design which thanks to the bottom opening windows and the roof has a very classic kind of look to it. The door may be a single door, but it is just over six feet high and is wide enough so that even getting larger items in here will be easy. Some may say that this has something of a castle look to it, well it is every bit as strong as a castle as well. 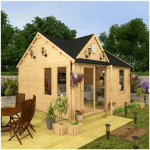 A very robust frame is used and this along with the tongue and groove shiplap cladding ensure you have a strong summerhouse that is going to last many, many years. The roof which is one of the most eye catching features has been made with tongue and groove boarding and then covered with high quality shingles. The flooring is able to handle even the heaviest furniture thanks to being made with very thick and strong tongue and groove boarding. 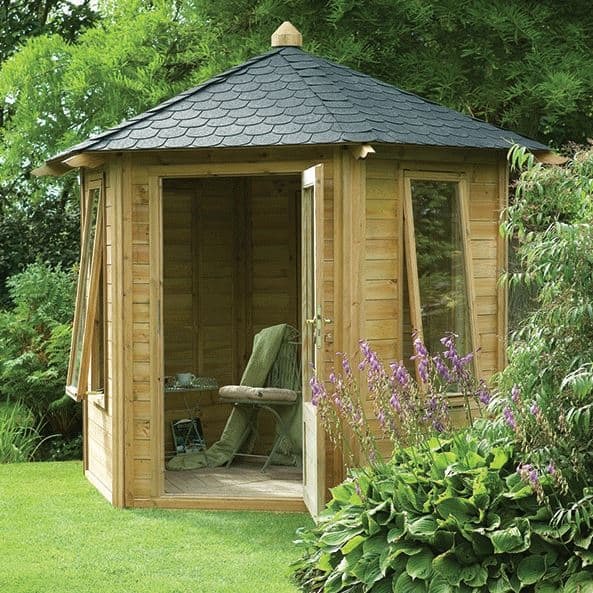 With its hexagonal design and classic kind of style the Hartwood 11′ x 10′ FSC Newbold Summerhouse is one of the most impressive and high quality summerhouses we have looked at lately. This thing is just absolutely stunning it really is also while the pictures do a great job in showcasing the good looks this has it really does not do justice just how large this is. 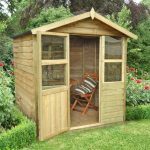 The hexagonal shape of course makes giving the exact space you have to play with inside a little tough, but the overall width is 11 feet 1 inch and the depth 9 feet 8 inches, so you will have a lot of room to make use of with this summerhouse. This is one of the highest summerhouse we have seen as at its peak the height is an incredible 9 feet 8 inches and even at the eaves the height is 6 feet 4 inches, which is just amazing as we have seen some summerhouses and shed that do not even have a ridge height as high as this. The conical roof that they have used is just epic, we know epic is a word that all the cool kids use these days, but it is certainly what best describes this. It has a very castle kind of feel to it, especially as they have used these fantastic slate looking shingles to protect the tongue and groove boards that make up the roof. This roof makes the summerhouse have such a unique look that we are honestly struggling to think of another summerhouse that has even attempted something similar to this. The tongue and groove shiplap cladding that they have used for this is amazing. We love the smooth and high quality look that it has, but the design of it also ensures that rain cannot get inside. It is very strong as it is an impressive thickness so it will be able to handle it f the kids get a bit wild while they are playing in the garden near the summerhouse. If you look closely you can see that the framing used inside the summerhouse is very well designed. 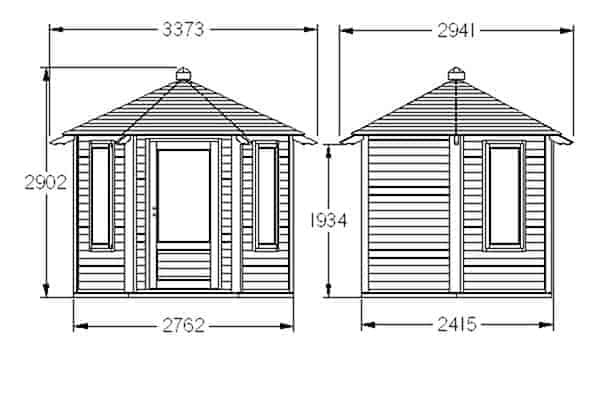 Not only is it a good sized frame it has been placed in the areas that matter to ensure that the cladding gets all the support it needs and that the whole summerhouse has a very strong build and a long lasting life. They have made the floor from thick and robust tongue and groove boards that are able to take a lot of weight. Which is a good thing as this is such a large summerhouse, we are sure you will be wanting to put all kinds of things in here. The floor is so strong that it could easily handle an arcade and pinball machine. Of course whether or not you are allowed do that is another thing entirely. While the flooring is very strong it also has a great look and we feel that they have chosen the perfect design as it goes very well with the rest of the summerhouse. 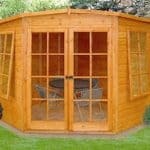 We suggest that you give the summerhouse a coating of wood treatment shortly after construction. While the wood will have treatment applied, you will still need to take responsibility for ensuring that it is well protected against rot and decay. A fresh coating just once a year is all that is required to keep the rot from spoiling the good looks of this summerhouse. 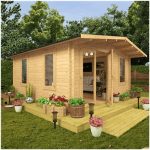 They are giving you a 15 year guarantee with the Hartwood 11′ x 10′ FSC Newbold Summerhouse which we consider to be very generous and all you are required to do in order to validate it is treat the summerhouse regularly. The door that they have used is great. While it is a single door, it stands at 6 feet high and 2 feet 9 inches wide so it is offering you plenty of space to get things in and out and also yourself when you have one too many glasses of wine. The door is made with the same kind of timber as the rest of the summerhouse and they have installed a strong toughened glass window on it which we really like. There are two good sized windows on this summerhouse and like the one that is on the door these are made with that same toughened glass. Those who have kids or grandkids kicking a ball around in the garden will be very thankful of this glass. While these windows do let in plenty of light, they can actually be opened so you can get plenty of fresh air inside as well. Anything that you place inside the summerhouse will be kept safe thanks to there being a lock included on the door. Not a cheap lock either this is a proper lock and key type of lock. We really like this as it means you do not have to pop down to Poundland and get a padlock once you have installed this summerhouse. This is a fairly open summerhouse due to the amount of windows and their size so you may want to add a set of blinds or curtains so that you can keep things a little bit hidden when you are not using the summerhouse. The outside of the summerhouse is pretty much perfect in our opinion which is a good thing as its design does not really offer much in the way of customisation. You could always change the colour if you want or just use a lighter or darker wood treatment. The vast space inside it is where you really get to make this summerhouse your own. Thankfully no extras are offered with this summerhouse. To be honest we are really not sure what there could be that you would want to add to it. Plus money saved on tempting extras means that you have more to buy awesome stuff to put inside here. 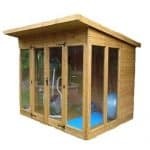 Truly this is one of the most high quality summerhouses that you can get. It is just so well made from top to bottom that it is impossible not to be really blown away by it. 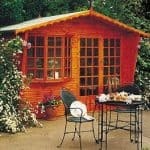 This is the kind of summerhouse where if you treat it right you are going to get a lifetime of use out of it. Only the best materials have been used here so you know you will not have any issues just a year or two down the road. You will have plenty of space inside here where you can easily fit in a sofa, some tables, shelving and anything else you may need. As this is large and also very tall it is going to be a little on the fiddly side. This is a two person job so be sure to have someone you can tolerate for around 8 hours helping you out. At a little under two and a half thousand pounds this is one very expensive summerhouse, but it is a case of you getting what you pay for as it really is one of the best when it comes to its design and the materials used. Final Thoughts: The Hartwood 11' x 10' FSC Newbold Summerhouse really is an impressive looking and very well made summerhouse that is bound to wow anyone who sees it. Its size is just ideal and the way it is designed and the materials used are high quality all the way. We are very impressed with this and even though it is one of the most expensive summerhouses, we must tell you that this is because it is made with the very best materials. This is for those of you who only want the very best and are willing to pay for it in order to get it. One thing for sure is that no matter who purchases this, we are sure they are going to be very happy with it.